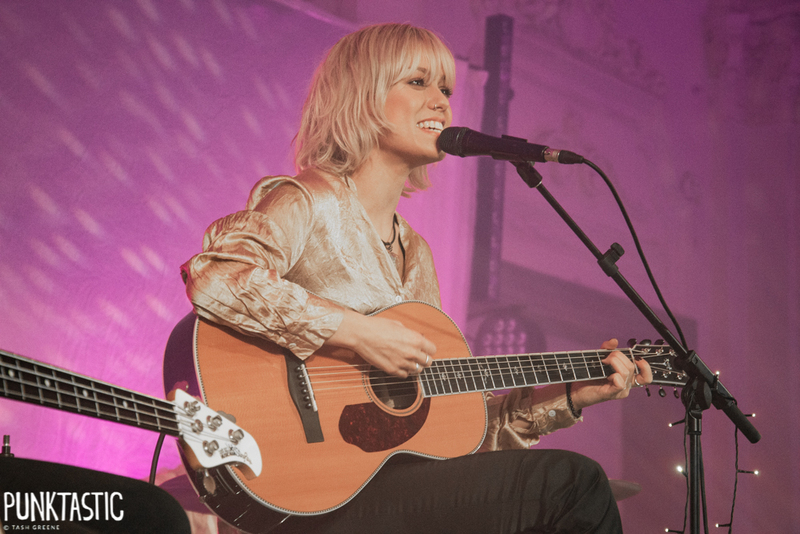 In stark contrast to the hectic fierceness that defined the previous night, the set up for Tonight Alive’s acoustic performance at Bush Hall was soft and gentle. Fairy lights dressed up the instruments and sound equipment on the small stage, creating an intimate atmosphere strengthened by the lack of barrier between the crowd and the stage. Unlike the fully plugged performance, the crowd was perfectly still from start to finish – and this time, their dedication to and love of the band was conveyed not through flailing arms and screaming, but instead tears trickling down cheeks and almost whispered lyrics. The evening kicked off with a lengthy video montage depicting the band’s journey over the past 10 years – the anniversary we were all there to celebrate. 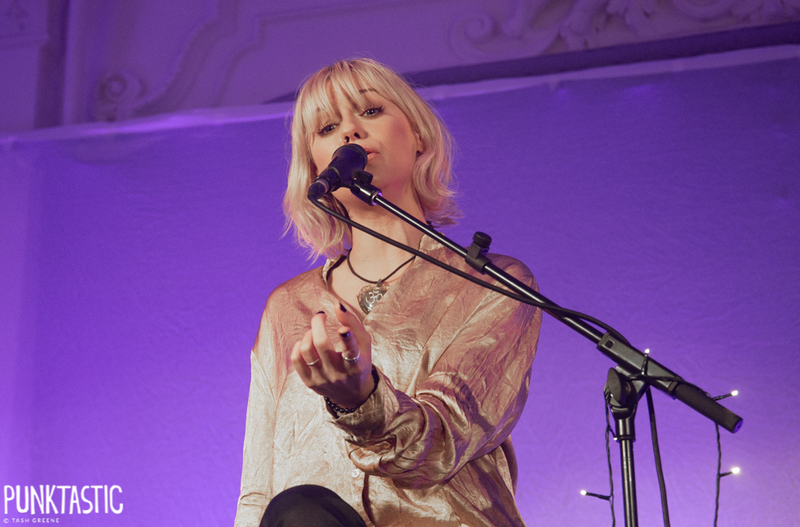 Accompanying the images were Tonight Alive’s own tracks, as well as other well-known songs by other artists such as ‘Complicated’ by Avril Lavigne. As the video progressed, soft giggles spread throughout the crowd, and cheers erupted whenever lead singer Jenna McDougall took centre screen. Whether it was naps on airport floors, the band’s varying haircuts, or footage that seemingly took place during the height of the ice bucket challenge, it felt like a comprehensive insight into the lives of the band that we love, and bridged any remaining gap between ‘us’ and ‘them’. In keeping with the general mood of the night, the band casually took to the stage, each of them sitting in their dedicated seats ready to play an entirely fan-picked set list. Gifts were held out by those in front as the crowd sweetly sang happy birthday to drummer Matty, and it was instantly clear that this was to be an incredibly special evening. The set list was made up of songs dating all the way back to the band’s first album, but regardless of age, each song was met with the same amount of enthusiasm and same effortless reciting of the lyrics as each other. It’s difficult to imagine a time when the band was surprised by the crowd singing louder than Jenna, but as was explained to us in one of her many anecdotes that evening, this used to be the case. ‘Wasting Away’ was the first song that the band experienced this with back in their hometown, Sydney, and as such has stuck with them for all this time. The stripped back versions of these tracks – many of which have rarely, if ever, been played live – were stunning, and if you weren’t already aware of the sheer magnitude of Jenna’s vocals, it was impossible to ignore it this evening. That said, what made the evening so magical (besides the fairy lights, of course), was the openness with which Jenna spoke to us about their lives – whether that be past relationships, fighting for authenticity with old labels, or any other number of personal stories. Often she found herself going into such detailed explanation of each song that she had to catch herself from speaking too much. It created a vulnerability which extended to everyone in the room, and it felt more like a friendship than ever before. This idea was only furthered when Jake, Cam, and Matty left the stage in order for Jenna to invite a fan – whose 28th Tonight Alive show this was – to accompany Jenna on the keyboard in a rare performance of ‘Looking For Heaven’. These seemingly small gestures mean the world to loyal fans, and brought everyone even closer together, in a spiritual sense at least. This unplugged tour was everything that this 10 year anniversary deserved. It highlighted who Tonight Alive are as human beings – how genuine and kind and grateful they continue to be – and it was a wonderful opportunity to sing along to music that may have otherwise stayed buried in the past with the very people who brought it to life in the first place. Here’s to what the next 10 years may bring.